The Case Relay Power System with included NP-F Coupler powers most devices that use a NP-F 7.4-8V battery with any USB 5V external battery pack. NP-F is a common battery type found in many popular cameras, video cameras, camcorders, Atomos and other video monitors, and memory recorders. It is also referred to as Sony L Series. The Case Relay DC Extension Cable allows photographers and filmmakers to extend the distance between the camera and Relay by 6.7 feet (2m). This allows for the Case Relay & battery to be away from camera and tripod allowing the photographer to swap batteries with no chance of tripod shake. The Case Relay Power System works by inserting the NP-F relay coupler directly into the device’s battery port, then connecting it directly to Case Relay. Case Relay’s own secondary, internal 1200 mAh battery, it’s easy to hot swap the external battery and not lose power to your gear. 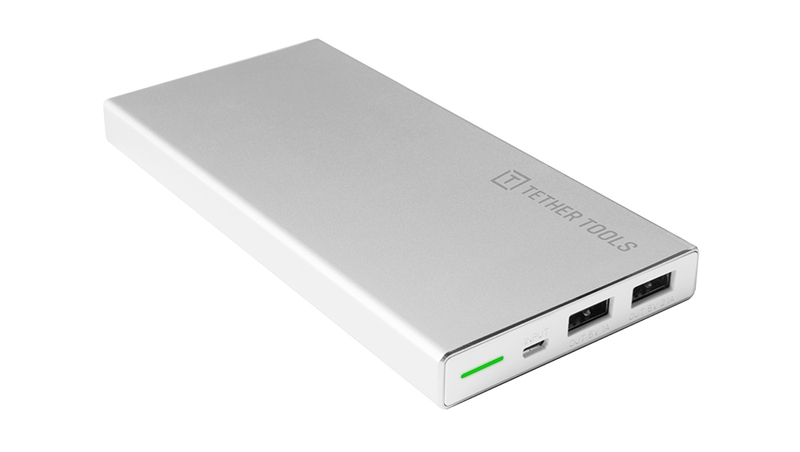 With the new Rock Solid External Battery Pack (10,000 mAh) from Tether Tools, creatives will be able to work considerably longer than with a standard NP-F battery. When access to AC wall power is convenient, simply plug the Case Relay cable into an AC Wall Adapter (sold separately) for an infinite power source. (USB Active Extensions can be used for added distance). The Case Relay Power System also works with DSLR cameras so you’ll never run out of power and never need to stress about forgetting your camera batteries. If you’re shooting and get low on battery power, simply swap out external batteries throughout your shoot. Case Relay’s internal UPS battery will keep your camera powered while you exchange external batteries. Utilizing a wall outlet or external batteries, you could in theory shoot forever with consistent power flowing to your camera through Case Relay. Power Video monitors and compatible video cameras.